Since starting our internship program three years ago, we’ve made a point of tracking data along the way. We’ve been especially interested in applicant volume and sourcing since those issues are especially pertinent to launching a new program. And, three years in, we have more points of comparison than ever. We’re less interested in drawing hard and fast conclusions than in getting a sense for trends and finding ways to improve. 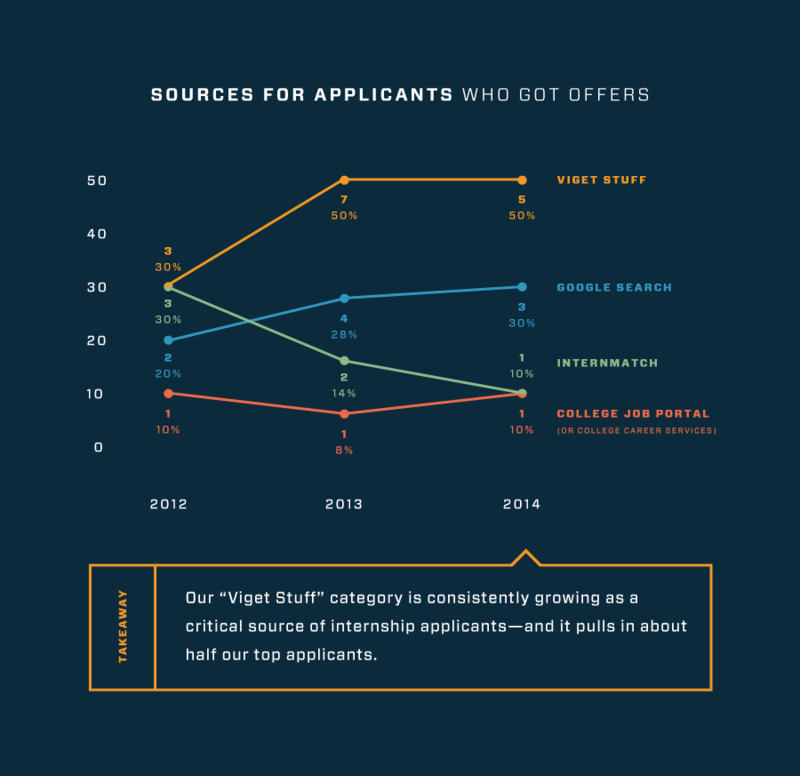 At this point, it seems safe to say that Viget can expect a few hundred internship applicants every year. We’ve also learned how much difference the official title of a role can make. And, finally, a lesson that comes as no surprise: our best source of top interns is our own work, culture, and people. 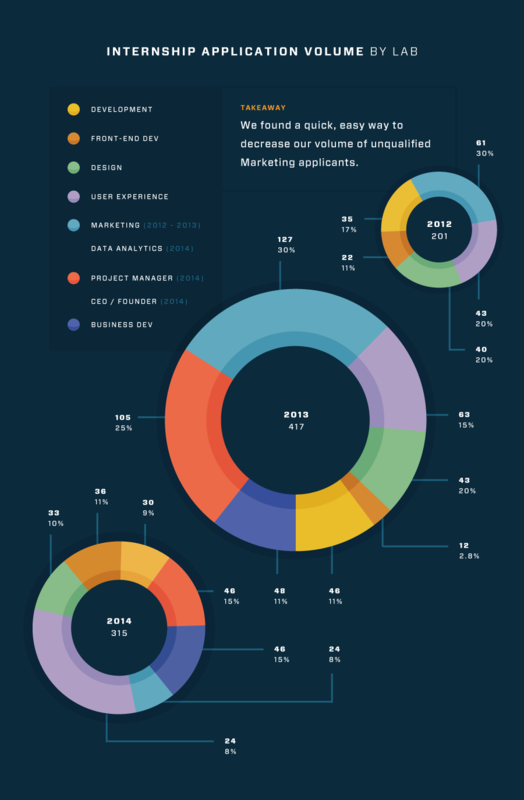 *Infographics by Janice Pang, 2014 Design Intern at Viget. As the below graphic shows, volume roughly doubled between 2012 and 2013. Then volume fell by about 25%, in 2014. However, this year’s dip in applicant volume is not a bad thing, as the next graphic helps show. 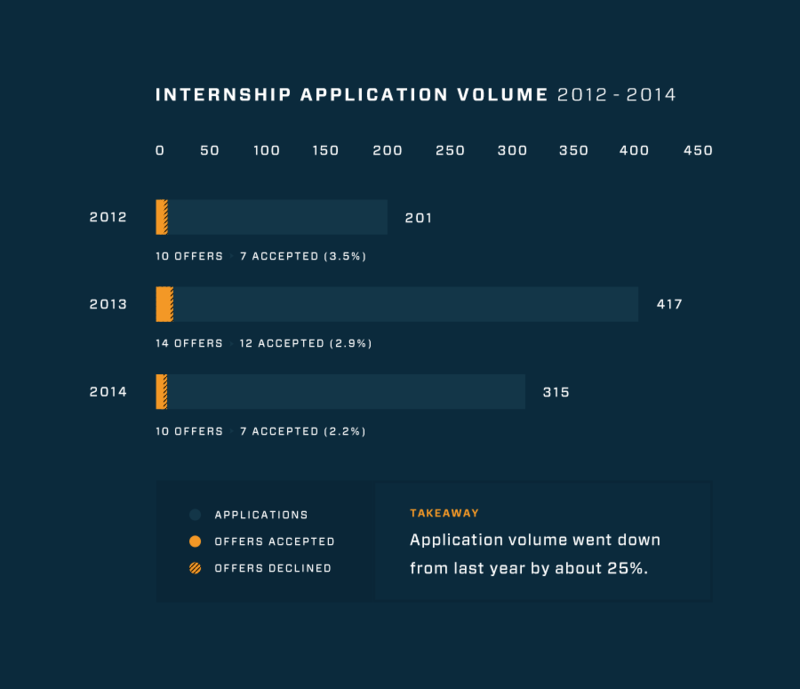 To understand the decrease, we need to consider the history of our Marketing internship role. In 2013, the “Marketing” internship received 127 applicants, with many of those applicants also expressing interest in the Project Manager internship. We found the majority of those applicants were unqualified for the role. That’s because they were interested in traditional marketing rather than in Google Analytics and working with data, which had increasingly become the internship’s focus. So, this year, we decided to swap out the word “Marketing” for the more accurate title of “Digital Analyst.” The nature of the internship itself—and our complete description of it in the body of our posting—has not significantly changed. We also decided not to offer the PM Internship at all, for unrelated reasons. We received twenty-four reasonably qualified DA applicants compared to last year’s 125 Marketing applicants. 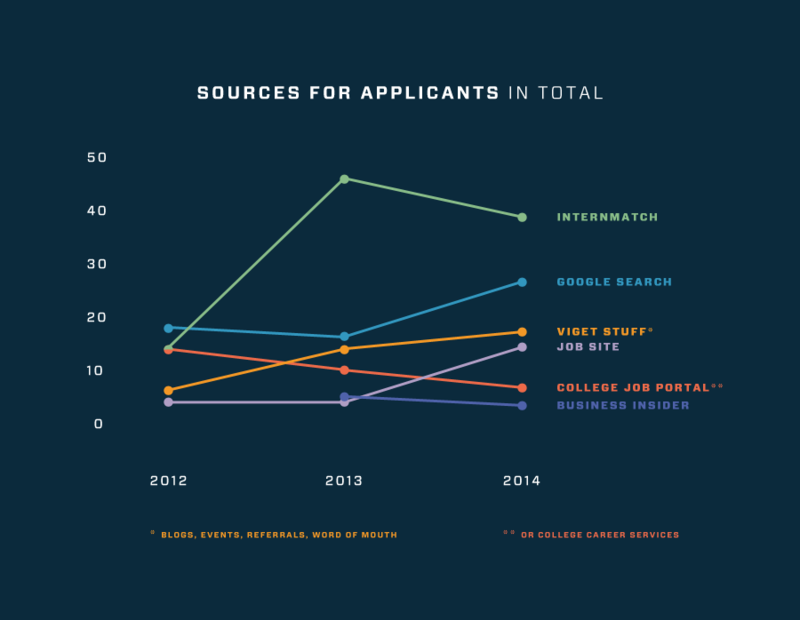 And it seems safe to say that the roughly one-hundred-applicant difference in this category probably accounts for this year’s dip in overall application volume. From the start, we’ve asked applicants how they find out about Viget and our internship program. This information helps us understand how to recruit for the following year’s crop. By “Viget Stuff,” we mean anything generated by our people here at Viget: our client work, events we attend or speak at, our blog posts, and word-of-mouth leads. More and more, I find, our top internship applicants hear about us via “word-of-mouth” in particular. When we first started our summer program three years ago, “word-of-mouth” was an infrequent applicant source. Now, I regularly hear, “my friend told me to apply” or “my professor mentioned it.” That’s a great sign that, as our internship program becomes more effective and cohesive each year, so does our broader community of former interns, professors, and friends spreading the word.